The President of The United States is dead. There is no Vice President to take his place. As the nation slips into a constitutional crisis, a small, secretive group conspires to violently seize power. They have the will. They have someone on the inside. And they have the explosives. Standing in their way is a woman who knows their intentions. Can she stop them in time? If she does, will it matter? Scary if it were true. Clayton Shepard is 249 miles above Earth when the lights go out. He has no communication, limited power, and an unbreakable will to survive. His one goal: find his way back to his family. Shepard is an astronaut on his first mission to the International Space Station. When a violent blast of solar magnetic radiation leaves him stranded in orbit, he's forced to use his wit and guile to find a way home. He has no idea what he'll find when he gets there. SpaceMan is a post-apocalyptic/dystopian tale that tells the survival story of a man and the family he left behind. It's written with the help of former astronauts, NASA team members, and well-respected astrophysicists that give SpaceMan a unique sense of detail and desperation. While I might compare this to The Martian (which I absolutely loved, FYI) -- Tom Abrahams' SpaceMan was different. Where in The Martian he was stranded on Mars because of a storm, this story follows an astronaut who is aboard the International Space Station when a massive CME (coronal mass ejection) plunges the station into darkness. The narration for SpaceMan was done by the amazing Kevin Pierce, who kills it as always. I've said it a bunch of times, but he really has the perfect Post-Apocalyptic voice. I was so pleased to find out that Pierce and Abrahams were teaming up again for this book (and hopefully series). 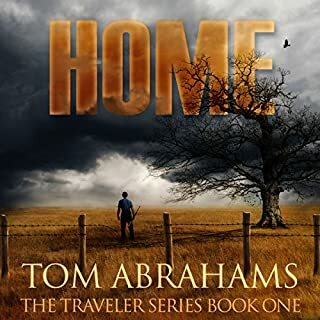 Pierce is able to provide the perfect narration to Abrahams writing style. The story itself, as with all of Abrahams' stories was perfect. The pacing and writing just flowed so effortlessly. I put this audiobook on last night and wanted to listen for a half hour or so -- I ended up listening for almost 2 hours. And even today, I couldn't put it down. Listening on my way to work, on my lunch break, and any other time I could find time. The combination of a Post-Apocalyptic world and astronauts is such a fresh and unique point of view, I couldn't get enough. Thankfully, there will be more -- with Descent being written as the next story in this series. Also, if you're curious -- the entire story does not take place in space. You also get to meet his wife and child and a few other people who are around the family. The back and forth from space to Earth was also really different and made the book feel that much more real. The main character, Clayton, made me laugh numerous times throughout. The way that he kept himself from freaking out or from losing it was so humorous (I won't ruin it here, just know it's funny). And the ability to make a person laugh when the person they are reading about is in a dire situation is a rare commodity. 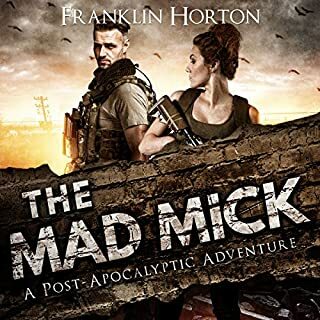 Overall, the fresh take on post-apocalyptic fiction -- mixed with the humorous main character make SpaceMan an incredibly enjoyable book, and honestly easily a contender for the best book I've read this year (out of 150+). If you enjoyed this review, please vote for it. If you want to see more like it you can check out BriansBookBlog DOT com. An astronaut, stranded in the space station after the event, has to painfully and laboriously reconstruct this idea, 'starting with what he knows about the sun' which is that the earth revolves around the sun. Seriously? This is where he starts? What is he, nine years old? I realize that an author has to be careful not to leave behind his audience when writing about scientific ideas but come on, does the author think that the kind of luddites who don't know the earth revolves around the sun are going to be reading his book? A father out camping with his son and son's friend is asked to jump a stalled car. He gets out his jumper cables and walks all the way over to the site with the stalled car where the woman he's helping has to ask him where his car is. Apparently it never occurs to him at any point that he requires a power source to accomplish his task; perhaps he was going to fasten the cables to one of those current bushes my husband is always telling me about. I found the relationships between the people in the book to be wooden and superficial; of course you can't expect in-depth characterization in a book of this type but I never felt an emotional connection with anybody, in fact as my annoyance increased, I sort of wished a gamma ray burst would follow up the EMP and wipe them all out. Bottom line, I'd spend my money/credit on One Second After by William Forstchen or Aftermath by Charles Sheffield instead, both of which involve EMPs knocking out modern society but are just done better (IMO). Amazingly bad job by author. Given the sales pitch, this book is hilariously bad. The supposed main character is so implausibly unfit to be an astronaut even the author seems to give up on him 3/4 through the book. No, they don't send neurotic people who are unable to pay attention into space. Those get weeded out very early so they don't end up finding themselves in space asking themselves if they are capable of anything at all. Author also had this weird habit of building up to some suspenseful moments only to drop the reader back into some truly autistic and somewhat weird storytelling. "Let me tell you this irrelevant stuff to up the page count while our inept protagonist builds up to his next neurotic inner dialogue"
And the story is wafer-thin. I'm actually curious how they got a narrator to read this crap. This author should stick to writing about rudely shaped vegetables in local newspapers. Ok let me get some confessions out of the way. This book is going to struggle in this review. The reason you may ask? I have just finished listening to two of the latest releases in two of my favourite long running zombie series. ‘Arisen’ (Book 11) and ‘The Undead’ (Book 12) series, and both of them happened to be the best in each series. 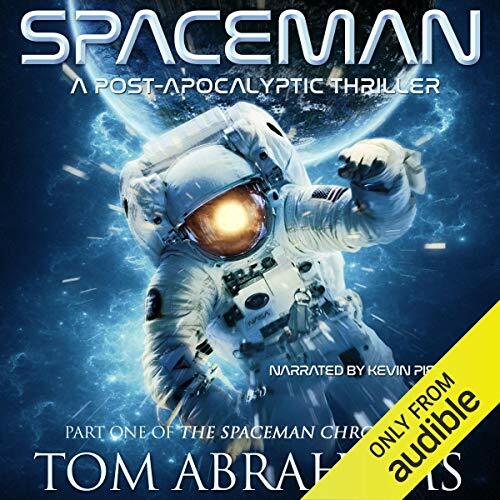 I enjoyed every part of them and the narration in both of them was brilliant… and it gets worse for ‘SpaceMan’ because I’m not a ‘Kevin Pierce’ fan. I hope I don’t offend the people who love listening to Kevin Pierce. Don’t get me wrong I think the guy does a great job, the quality of recording is good if not great. He doesn’t seem to stumble over any words or names, he nails the emotions of the characters. But his voice just seems so old fashioned for my liking. I even increased the playback to 1.5x speed just so I could get over listening to him. Please notice I used the words ‘my liking’, you may just think I’m a idiot… and you are probably right. But do yourself a favour and listen to the sample first and then make a call. This isn’t a long story just 7 hours and 40 minutes, so speeding it up shortened the length dramatically. Also very important if the $ per hour factor plays a role in your purchasing decision… it certainly does in mine! On the point of not being an long story, is the fact that it is only part of the story. I like stories which in themselves have some conclusion. This one doesn’t really, it is left for the next in the series. I do feel a little ripped off because of the fact this story is so incomplete and because of the shortened listening time due to speeding up the narration. I feel as though this should have been combined with the second in the series. The total length with the two combined would be no more than many other stories I regularly purchase. Ok with that gripe out of the way, it is onto the story itself. "Clayton Shepard is 249 miles above Earth when the lights go out. When a violent blast of solar magnetic radiation leaves him stranded in orbit, he’s forced to use his wit and guile to find a way home. He has no idea what he’ll find when he gets there. SpaceMan is a post-apocalyptic/dystopian tale that tells the survival story of a man and the family he left behind. It’s written with the help of former astronauts, NASA team members, and well-respected astrophysicists that give SpaceMan a unique sense of detail and desperation". The story does has many things going on, and quite a few characters. But at no stage did I feel part of the story. It didn’t get me thinking ‘what would I do?’ or ‘I would have done that?’ But once again I could not fault the story, there where no glaring mistakes except for an explantation of why some electrical equipment on the space craft worked when everything else didn’t. The author certainly comes across as having done plenty of research. Now I know these comments are going to put in ‘negative nancy’ light compared to other reviews on audible. But like I said it was going to struggle because of what I had listened to prior to this one. The narration problem was purely my person taste. 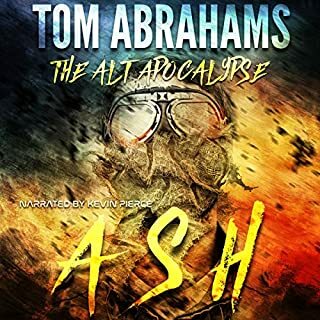 If you listen to the sample and don’t mind Kevin’s voice than you will probably like this story and I do hope you do, because Tom Abrahams certainly deserves high praise for his ability as a author! For me personally, the fatman is giving this one just one thumbs up and with no ‘heeeeeeeey’. I am usually very pleased with almost anything that Kevin Pierce narrates, and his storytelling is always superb, but this was a hard story for me to care about. I really enjoyed Tom Abrahams' Sedition Political Conspiracy book, and maybe my expectations were too high. There was also a dig against the kind of creationist wackos who would patronize the creation museum in Petersburg, Kentucky. Somehow all of the Christians turn into mindless bloodthirsty minions of anyone pretending to hear from God. It put a sour taste in my mouth that might have colored my experience of the rest of the book. I don't think I will continue with this series, and I definitely would have employed Audible's exemplary return policy if I had paid anything for this audiobook. But, who knows? Someone might like this book. I appreciated that it was a coronal mass ejection story rather than an emp story, just to change things up. Kevin Pierce Rules! I got this book as a free gift from the narrator, Kevin Pierce. Related to that, I've reviewed other Kevin Pierce narrated novels and enjoy them a lot. Overall I like the narrator even when the actual book has some issues. Kevin did a great job on narrating this novel. I want to declare that first so that I can discuss the novel itself. At a high level, the level of detail of the ISS was pretty good. But the behavior of astronauts and cosmonauts wasn't. The main protagonist that gets sent to the ISS is under trained and LITERALLY would not ever qualify for being sent upstairs. The behavior of the people onboard is not representable by experience of the dozens of people that have been up on the ISS over the last 20+ years. Beyond that, the story is interesting and following along with an astronaut trying to get home is reasonable. Book is a 6/10, Kevin's narration is a solid 10. How do you know when a book is good? How did I know this book was good? I was leaving for a 2 hour drive for thanksgiving that I was not looking forward to, that turned into a 5 hour drive! Traffic! the drive was a lot more pleasant while listening to this story while driving.. instead of thinking about the traffic I got to focus on the story. this is a nice twist on a SHTF story. it involves being trapped in space. and how he needs to got back to earth to find his family. The space stuff was nice. But liked the family stuff better. I seeing who others get though this kind of thing. this story is a short fast story, that will lead you in to book two. WOW!! A great post-apocalyptic thriller! SpaceMan is the start of the SpaceMan series. We know the next in the series will be Descent and the third one will be Retrograde. SpaceMan does well as a stand alone novel although there are some unresolved issues. This novel is set in the near future. An apparent natural electromagnetic pulse (EMP) shuts down electricity and communications on earth. It also damages the Russian space station which is manned by two American and one Russian astronauts. The novel deals with both the situation on the ground and on the space station. The work of an astronaut on the space station has shades of fix anything by The Martian. SpaceMan is an outstanding novel with superb narration. I VERY HIGHLY RECOMMEND SpaceMan. I regret using a credit. I gave it two hours and just couldn't take it anymore. Writing is sophomoric. The dialog is forced and implausible. The characters have the depth of paper dolls. I do not recommend this book. Not every story line is a series. It's a PITA to listen to a book thinking "OMG finish already". Creating a false sense of drama over and over just to stretch it out to get more $ (another book) is a plague growing throughout the industry. It wastes my audible credits and turns me off for authors to do this. This story has incredible potential, but not listening to the 2nd book. The pace in which society breaks down in this book is unrealistic... Less 24 hours into no electricity a hoard of bible-thumpers block the road in robes??? Unnecessary drama.... The entire book could have been done in 3 hours once you take out all the times something could have happened, but didn't. "Tell me this is a dream." The International Space Station is at half strength and two of the three astronauts are outside conducting emergency repairs when it is caught up in unexpectedly violent magnetic storm. So begins the nightmare for Clayton Shepherd, the one man left aboard. With all communication lost, he cannot tell if his companions are still alive, has no way to seek help from Houston, or even know what might be happening on Earth below him, and to his family there. For a short while he will be safe - but not for long. 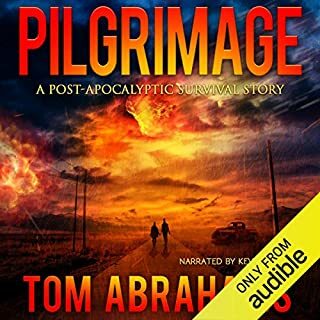 This is a remarkable reworking of the often-too-similar (even if excellent) post apocalyptic stories which tend to follow small groups of people battling to survive over time as the situations worsen and social breakdown as well as hunger force people into ever increasing barbarism. Instead, this book concentrates on Shepherd's dilemma in his isolation as his space station hurtles onward at five miles per second, and the experiences of his wife and two children caught up in the aftermath of the coronal mass ejection back on Earth. And it covers only the first few hours. The characters are fully three dimensional and the whole scenario feels very real. The confusion felt, the pain of loss and fear for loved ones who cannot be contacted is palpable whist the decisions made by the astronaut of only ten weeks experience are real hold your breath stuff. 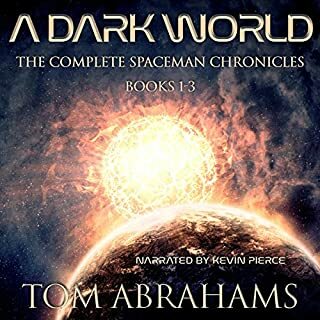 Kevin Pierce's narration adds to the feeling of verisimilitude, his impeccable reading, his distinctive voicing of the various protagonists and his perfect pacing of the book make this a superb performance, no histrionics just solid story telling. Excellent new spin on this genre! I remember reading the synopsis in Audiobook Boom and having listened to a few of Kevin's narrations already I thought I'd request the book. I admit, I wasn't too sure about the 'space part' but this book was a very unique tale that I soon got behind. The fact is no one expects bad news, or something to happen so quick that you don't get to think, feel or react without severe consequences. What happens here for Clayton, his family and those who are close is very hard to swallow. The fact is it could happen, at anytime. And the more I listen to these kinds of stories from the authors that Kevin has narrated, the more I'm concerned. The realistic 3d characters that these writers portray, especially Tom are a joy to the ears. Everything happens for a reason, every character twist and turn is there because I can clearly see them as real human traits. The story is not without it's horrid situations, no one can see a plane crash and listen to people dying and not be turned off, but also feel... it's the feeling and the emotion that this story evokes in you, that really makes this one stand out in the crowd.